A combat engineer of the Russian Armed Forces' International Mine Action Center clearing mines from the ancient town of Palmyra. Russian Armed Forces General Staff Deputy Chief Col. Gen. Sergei Istrakov has given awards to more than 30 servicemen of Russia's engineer troops who took part in mine clearance operations in Syria. The awards were presented at the International Mine Action Center. "More than 800 hectares of territories, 23 kilometers of roads and 10 historic heritage sites were cleared of explosive items during these efforts. The result of the work accomplished by you was the successful fulfillment of the task set by the supreme commander-in-chief and the profound gratitude of the Syrian people," Istrakov said. Russian bomb disposal experts cleared mines from over 2,500 buildings and facilities, as well as finding and defusing some 17,500 explosive items, including more than 400 improvised explosive devices, the Defense Ministry said. 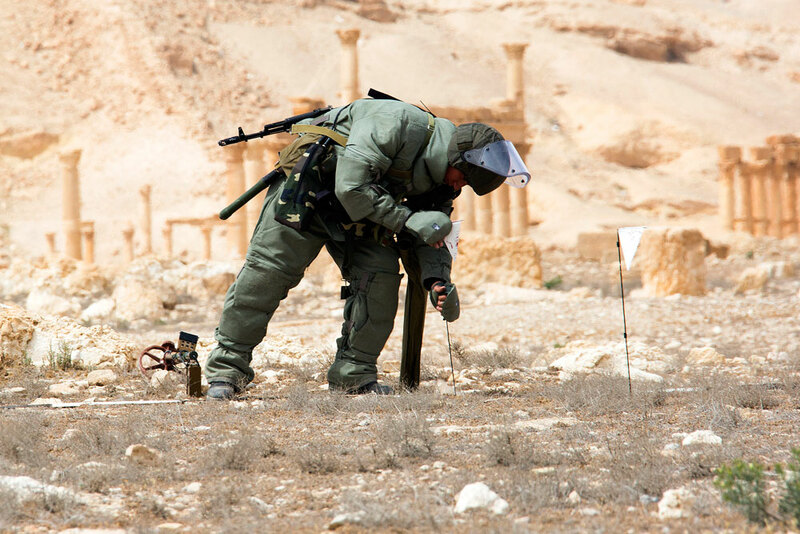 Russian specialists from the International Mine Action Center were tackling tasks as part of Palmyra's humanitarian mine clearance for more than a month and a half. Russian bomb disposal experts cleared the city's residential areas of mines after removing explosive items from the historical part of Palmyra. They had to deal with complex and new methods of explosive device planting by terrorists - radio-controlled landmines, wire-controlled anti-disturbance mines, as well as a large number of different mine traps.